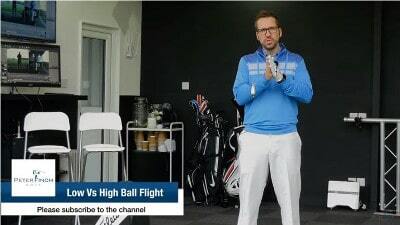 PGA Teaching Professional Peter Finch explains how golfers can learn to control ball flight between high and low trajectories, which is especially useful in windy conditions. As he demonstrates, by positioning the ball in the center of his stance and placing 65 percent of body weight on the lead foot, a golfer will be able to drastically alter ball flight. Using the FlightScope launch monitor, he is able to see the difference in shots as he makes adjustments in between swings.